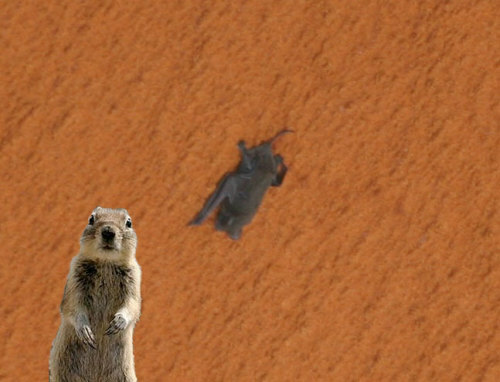 A squirrel has been seen attempting to savage a fruit bat to death. The bizarre incident was witnessed by zoologist Mr William Stanley, while he was conducting fieldwork in the forests of Tanzania. "No-one has recorded this type of behaviour or incident before," says Mr Stanley, who saw the squirrel try to kill the bat in a tree above his head. Rodents are not known to eat meat or hunt animals, so it is unclear why the squirrel would launch such an attack. Mr Stanley, who works at the Field Museum of Natural History in Chicago, US has published details of the incident in the African Journal of Ecology. For the past 20 years, he has studied small mammals in Tanzania, focusing on shrews, bats and rodents, usually conducting field work during July and August. During one afternoon survey in the Mwofwomero Forest, in the Rubeho Mountains, he heard a fruit bat shrieking. "It was strange to hear an alarm call or vocalisation from a fruit bat typically we hear at night," he told BBC Earth News. "That's what caught my attention. When I looked up I realised that there was a squirrel up in the branches where the noise was coming from. The next thing I saw was the flapping of the bat's wings." Mr Stanley then describes how the events unfolded. "It became apparent that there was an altercation happening between the squirrel and the bat, something I'd never seen before or ever heard of." "The squirrel had the bat in its mouth, or it was at least biting it, and then the bat went quiet for a while and then starting flapping its wings again." "The second time it started vocalising and flapping, the squirrel released it and the bat fell out of the tree and literally fell into these small saplings right above my head, and ultimately to my feet." Mr Stanley recovered the now dead bat, a species known as Epomophorus wahlbergi , and photographed it. "Both wings were broken at pretty much the same place on the same side and the side of the head was fractured," he explains. Why the squirrel would want to kill the bat is a mystery. Mr Stanley and his colleagues identified the squirrel as a Svynnerton's bush squirrel ( Paraxerus vexillarius ), which at a weight of around 280g is three times heavier than the 89g bat. Like most other rodents, Svynnerton's bush squirrels eat vegetable matter, fruits, nuts and small insects. No squirrels are known to hunt vertebrates, or even scavenge meat. "The least likely hypothesis is that the squirrel was preparing to eat the bat," says Mr Stanley. "The bat was injured and damaged in very specific places. This is pure speculation, but it's almost as if the squirrel was seeking to maim the bat in some way. Maim it or kill it such that it couldn't fly." "Either the squirrel thought the bat was a threat to it, or to its young if they were around, or to a food source. Maybe the squirrel was going after some fruit and the bat was hanging there and the squirrel wanted to get rid of some competition." "Another possibility is that either the squirrel or the bat were mentally off balance." "I don't think this is normal," he adds, suggesting that injury or disease could also have prompted the bizarre interaction. In the African Journal of Ecology research paper, Mr Stanley and colleague Ms Leah Collett, who works at the Animal Behaviour Research Unit based in Mikumi, Tanzania, describe another rare incidence of bat predation. Conducting field work in the Mikumi National Park, Ms Collett witnessed a yellow baboon eating another fruit bat of the same genus ( Epomophorus minor ). While baboons are known to eat reptiles, birds and some mammals such as hares, they have never before been recorded eating bats. "What was really intriguing about this, which may be pure coincidence or not, is that both the bat and the baboon that ate it were pregnant," says Mr Stanley. A fruit bat doesn't count as one of your 5-a-day! He actually meant baiting it. That solves it. I wonder if the squirrel could have had rabies? The don't usually suffer from it, but apparently only because they're small so most bites are fatal ones. Tsssk typical. Killing a harmeless bat. I've watched bats catch insects at night and even put up a box for them that has never been used. Here's a photo I've posted earlier that shows some in Costa Rica that line up to mimic a snake. I was told that they will move back and forth to add to the act. I've given meat to rodents including squirrels. They have taken it and eaten it. In my neighborhood the cats get killed by coyotes. Killed but hardly ever eaten. My theory is that its to reduce the competition. Anyway, yeah, I find them less than cute. Unless they're converted to wallets and / or bedroom slippers. Keep it up and you'll find yourself on the menu. No worries. Squirrels are far to busy glaring at camera lenses. If this thing turns into a street ... er... tree-fight, I've got your back vampire. I just noticed how similar we look.